Our friends back in California just got a new puppy, too. 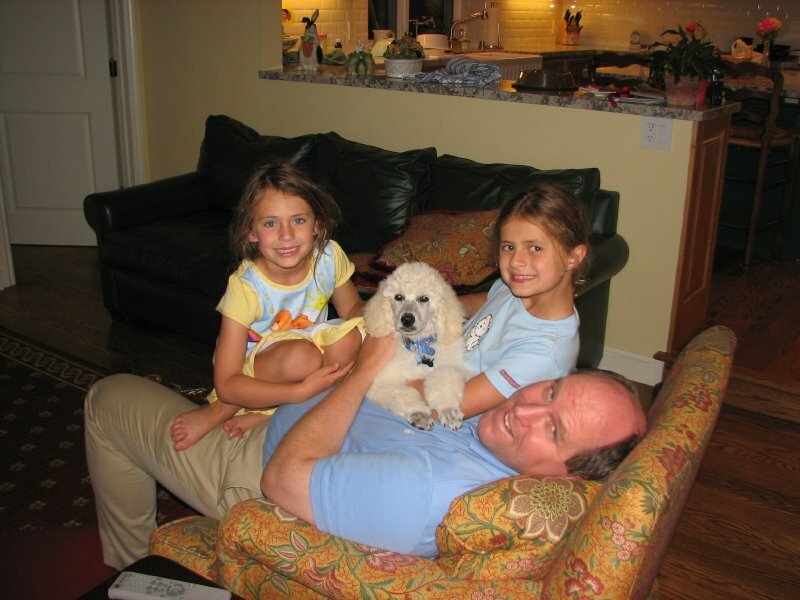 Bob is a white standard poodle. He's just a day younger than Cleo. Carolyn sent us this wonderful family photo of Bob surrounded by Bridget, Mary and Todd. On Sunday, June 18th, our family gained a new member. Her name is Miss Cleopatra, Cleo for short. 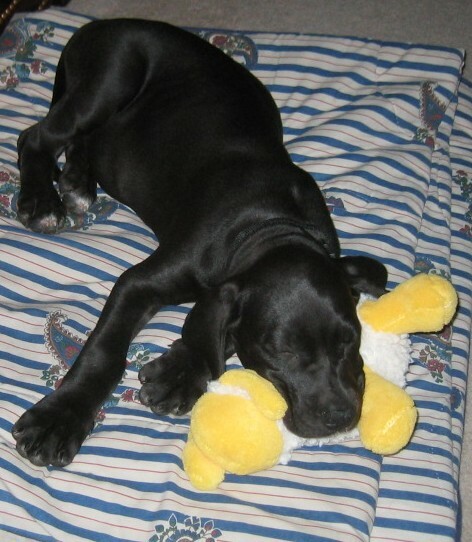 She is a Great Dane, 9 weeks old, 19 pounds, all black except for a white patch on her chest, four white toes and white patches on the backs of her ankles. She is utterly adorable as you can see. Thumbs down on "Fields of Freedom"
While in Gettysburg, we went to see the new movie, Fields of Freedom. For $8, I expected something more. It's basically a 30-minute dramatization of the final day of the Battle of Gettysburg, focusing on a couple of soldiers from either side. It's the kind of thing that PBS might do. It would make a fine addition to the National Park Visitors Center as a freebie, but it's not worth paying for. Go to the Gettysburg Cyclorama Center to see a couple of free movies instead. They're old but they still work. (History is kind of convenient that way.) Just for your information, the Cyclorama itself (a 360 degree painting) is closed for restoration and the building is scheduled to be demolished to make way for a new visitors center. Maybe you're better off waiting a year or two before you visit Gettysburg. On Sunday, June 4th, we left Calabash for Williamsburg - the start of a 5 day touring vacation. First we drove to Yorktown and visited the National Park and town. The most interesting part was probably walking around Redoubts 9 and 10, although the movie at the visitor center gave a good summary of events to give us perspective. Next we walked around Colonial Williamsburg down the main street and through Merchants Square. On Monday morning we drove to Washington D.C and spent a couple of hours wandering around the National Arboretum. It is an amazing place and we could have spent a lot more time there. Definitely a place to return to. Next it was on to Annapolis. We visited the State House, the US Naval Academy and took a boat ride around the harbor on Watermark cruises. The State House was also, for a brief period, the home of the Continental Congress (Nov. 1783 to Aug. 1784) and is now the oldest State House still in active use. The Naval Academy Chapel is very picturesque, particularly the dome. We enjoyed a good meal on the outdoor terrace at Phillips Seafood at City Dock. Lisa went for the true Maryland meal and had Cream of Crab soup followed by Crab Cakes. Unfortunately, the next morning, Lisa had a bad case of food poisoning. We postponed our departure for Longwood Gardens, Pennsylvania for a couple of hours until she finally felt she could manage the drive. It turned out she was a little optimistic! After a brief relapse during the journey, she did feel quite a lot better and so we drove on to Longwood. We spent the afternoon wandering, slowly, around the gardens and waterfalls and conservatory. They are wonderful. After a short rest and a dinner of bread and saltines (for Lisa) we returned to Longwood for an evening outdoor concert featuring Time for Three, a young trio of musicians playing violins and double bass - very entertaining. We rounded off an extremely long day with the illuminated fountain display at Longwood - well worth the wait (but we were glad to have brought our lawn chairs with us). We decided to change our route on Wednesday. Lisa was still not feeling great and we were supposed to drive to New Jersey to visit a friend and then back to Philadelphia, where the highlight of our stay was to be dinner at Susanna Foo. Instead, we spent the morning at Kennett Square (near Longwood) and then drove on to Hershey to see Chocolate World. We ended up in Gettysburg where we stayed for the next couple of nights and relaxed the pace a little. It was disappointing not to see Len, and missing our great meal, but we will go to Philadelphia some other time. In Gettysburg we toured the battlefield and visited the National Cemetery and Cyclorama. We had a good lunch at The Pub, sitting outside right on Lincoln Square (which is actually a roundabout). Lisa was getting more adventurous and had a grilled cheese sandwich. We (mostly Steve) also ate at the Dobbins House (so-so tourist trap) and the Gingerbread Man (better). We returned home on Friday to find that Calabash had been experiencing violent thunderstorms all week. The weather gods had looked kindly upon us on our trip and kept us dry and comfortable.